A photo from last year's GLOW at the Park. The annual party features light installations, music and food. Fairmount Park Conservancy’s seventh annual GLOW in the Park will take place Thursday outside the Fairmount Park Horticulture Center. The space will be lit up by a 3D light installation, designed by experimental artist Sunil Garg, and fire pits. Party-goers can dance to music by Motown band the York Street Hustle, while drinking Yards beers and Tito's Vodka cocktails. To eat, there will be small bites from Constellation Culinary Group (formerly Starr Catering), as well as a selection from local food trucks. Milk + Sugar, Miss Rachel's Pantry (vegan), SoPhiE and Revolution Taco will serve their specialties. Tickets for the event are $75 online, and $100 at the door. Included is food, drink and $35-level, year-long membership to the Fairmount Park Conservancy, which can be used to register for free upcoming events like hikes, yoga classes, trail runs and more. 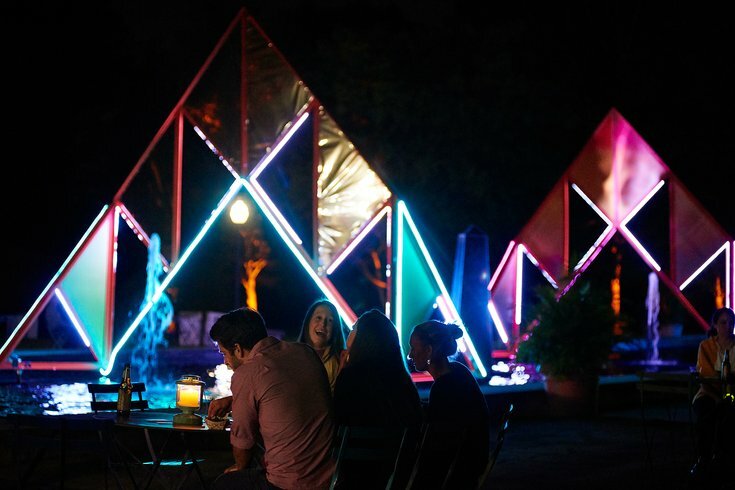 If you're already a Fairmount Park Conservancy member, you can purchase a ticket to GLOW at the Park for $45. Proceeds from the event will support the Conservancy’s work in Philadelphia's parks. Philly has one of the largest urban park systems in the world. Thursday's party will take place rain or shine. In the case of rain, the event will be held in the greenhouse.